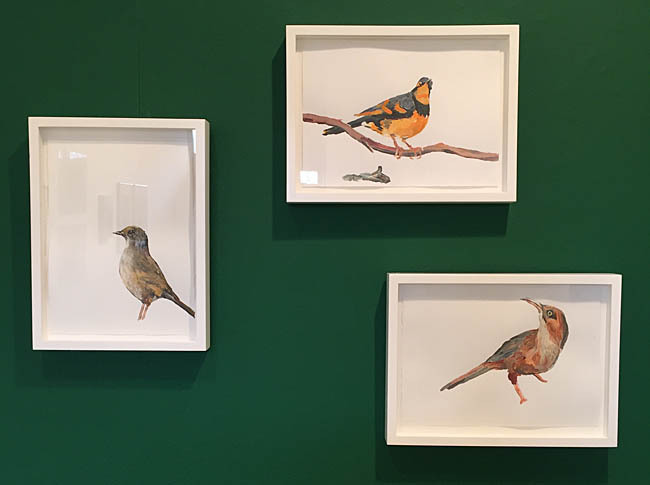 Aviary is an exhibition of paintings, sculptures and drawings of birds that together form an Aviary of artworks of birds that feel ‘alive’ (without necessarily being realistic looking). In a way the birds function as self-portraits (or familiars) for the artists: they are cultural signifiers as well as stand-ins for memories and emotional states. The works come from a wide range of artists – canonical and outsider, contemporary and historical, and a broad sweep of nationalities and ages. Three of the artists in Aviary (Sutapa Biswas, Aubrey Williams and Rose Wylie) have works in the Tate collection. Aubrey Williams’ Tick Bird belongs to a wider series of paintings of tropical birds – documenting the birds of Guyana (where Williams was born), the Caribbean and South America. 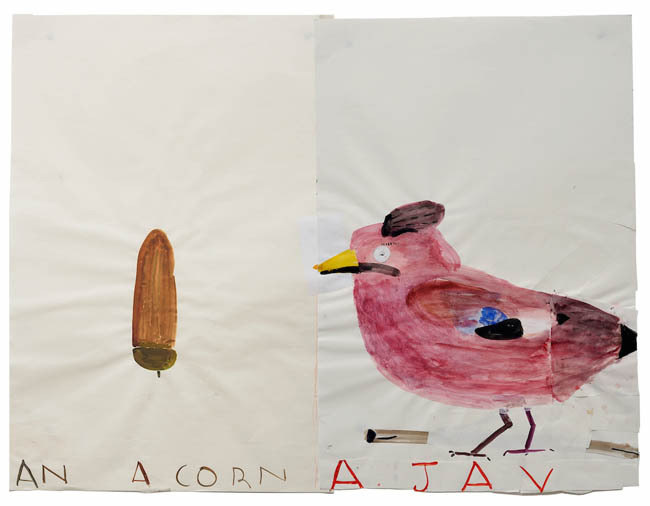 Rose Wylie’s large drawing Acorn & Jay incorporates text, collage and paint to create a playful narrative of two halves. Other works include Sutapa Biswas’s watercolour birds, Franki Austin’s glass work, paintings from Frances Cowdry, Nathan Eastwood, Jennifer Hooper, Matthew Krishanu, Alli Sharma and Chiz Turnross, watercolours on porcelain by Annabel Dover, drawings and printing from Adam Bottomley, Mehrdad Rashidi, Alice Sielle and Rita White, and large scale drawing ‘scrolls’ by Susan Sluglett. Matthew Krishanu is a painter based in London. He recently co-curated The London Painting Survey (2015), and has curated collaborative exhibitions for English Heritage, Iniva and RIBA. Niamh White is an independent curator based in London. She is co founder of Hospital Rooms, which commissions contemporary art for mental health hospitals, curator of the Dentons Art Prize, and curator of The Pierrot Project.